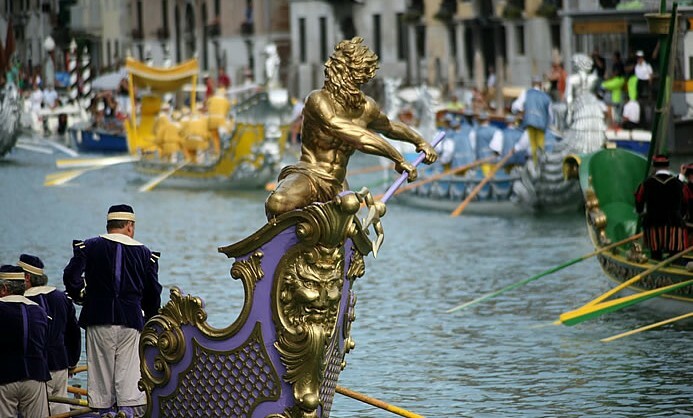 The Regata Storica is the main event in the annual “Voga alla Veneta” rowing calendar. This unique sport has been practised in the Venetian lagoon for thousands of years and today it is particularly well-known for the spectacular historical water pageant that precedes the race. Scores of typically 16th century-style boats with gondoliers in period costume carry the Doge, the Doge’s wife and all the highest ranking Venetian officials up the Grand Canal in a brightly coloured parade. An unforgettable sight and a true reconstruction of the glorious past of one of most the powerful and influential Maritime Republics in the Mediterranean. Today there are four races divided in terms of age and type of craft. The best known and most exciting of these is the “Campioni su Gondolini” race, where a series of small, sporting gondolas fly down the Grand Canal to the finishing line at the famous “machina”, the spectacular floating stage located in front of the Ca’ Foscari palace. Great campsite... If you want a quiet, simple and cheap campsite near Venice this is perfect. The place was clean and the staff was helpful. The best thing is that their restaurant serves reasonably priced food in the evening. I stayed in a two-bed ensuite and it was good value. This campsite is quiet but with the added gem of being right on the public transport route to Venice [...] The staff are friendly and helpful. We’re ready for the season 2019!